To explore the Folk Tale Genre of Traditional Literature including Legends, Myths, Tall Tales, and Fairy Tales. To teach the unique elements of each type of folk tale. To help students apply their prior knowledge of Plot and Story development to analyze folk tales. To motivate students to write an original story. To help students apply their knowledge of tall tales to their stories. To enable students to expand their ideas and publish their stories. To explore and learn about the Folk Tale Genre of Traditional Literature including Legends, Myths, Tall Tales, and Fairy Tales. To learn and recognize the unique elements of each type of folk tale. To demonstrate the student authors knowledge of elements of Plot, Tall Tale stories, and writing structure. R2 - Determine central ideas or themes of a text and analyze their development; summarize the key supporting details and ideas. R3 - Analyze how and why individuals, events, and ideas develop and interact over the course of a text. R5 - Analyze the structure of texts, including how specific sentences, paragraphs, and larger portions of the text (e.g., a section, chapter, scene, or stanza) relate to each other and the whole. W3 - Write narratives to develop real or imagined experiences or events using effective technique, well-chosen details, and well-structured event sequences. W4 - Produce clear and coherent writing in which the development, organization, and style are appropriate to task, purpose, and audience. W6 - Use technology, including the Internet, to produce and publish writing and to interact and collaborate with others. SL 1 - Prepare for and participate effectively in a range of conversations and collaborations with diverse partners, building on others’ ideas and expressing their own clearly and persuasively. Discuss what I EARN and the Young Author programs are and how the student can participate. Make students aware of a wider audience and recognition of their story. Review Plot and Story Development. Introduce the Folk Tale Genre by watching a power point on the Folk Tale Genre. Make a Layered Foldable Flip Chart (see resources for instructions and picture) and complete the Title which is Folk Tale Genre; first layer which is What is a Folk Tale; and second layer which is Types of Folk Tales. Explain that extra time will be spent studying Tall Tales and today the other types of Folk Tales will be discussed. Share examples of myths, legends, fables, and fairy tales. Discuss the elements and traits of each type of tale. Discuss what makes John Henry a Tall Tale. Display the power point on the Tall Tale slide and fill in the layered flip chart section three which is Tall Tales and their definition. Continue to fill in the chart by writing Elements of Tall Tales in section four. In the final layer of the chart writeExamples of Tall Tales and list John Henry as the first example. Divide the class in to four groups. 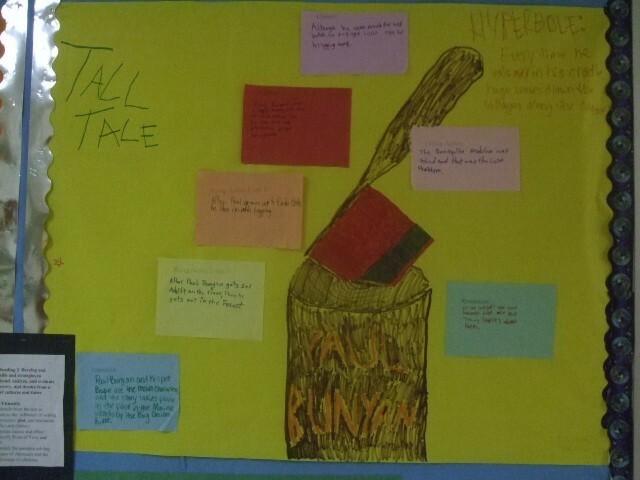 Assign each group a Tall Tale from the book American Tall Tales by Mary Pope Osborne. We used “ Pecos Bill”,” Paul Bunyun”, “Sally Ann Thunder Ann Whirlwind”, and “Johnny Appleseed”. Using the Group Tall Tale Worksheet (see resources) and the student’s flip charts fill out the worksheet. Using the Plot Diagram (see resources) have each group determine the Plot diagram of their story. Finish the group posters and have each group share their creations. Take a written assessment over the elements of a tall tale and what is a folktale. Begin the first day of writing by reading another mentor text. Use The Bunyans which is a fun play on the Paul Bunyun family so it can relate to an original tall tale story. Discuss how the book is the same and different that the original tale of Paul Bunyun. Discuss the elements of a tall tale that are present. Begin to brainstorm and plan an original tall tale. List a few ideas in the students writing journal or on paper. Who, What, When, Where, and How questions should be planned. When the story is planned, begin writing the story. Students should complete a rough draft, edit with a teacher, and a final copy complete with some illustrations. This may take part of several days. Formative assessment can be taken on successfully completed flip charts, evidence of hyperbole on the white boards, and group participation. A summative assessment can be designed to test acquired knowledge of the elements studied. The story will be graded using the story guide. American Folk Tales, by Mary Pope Osborne, Knopf Books for Young Readers, Sept. 4, 1991. John Henry,by Julius Lester, Puffin, Dec.1, 1999. 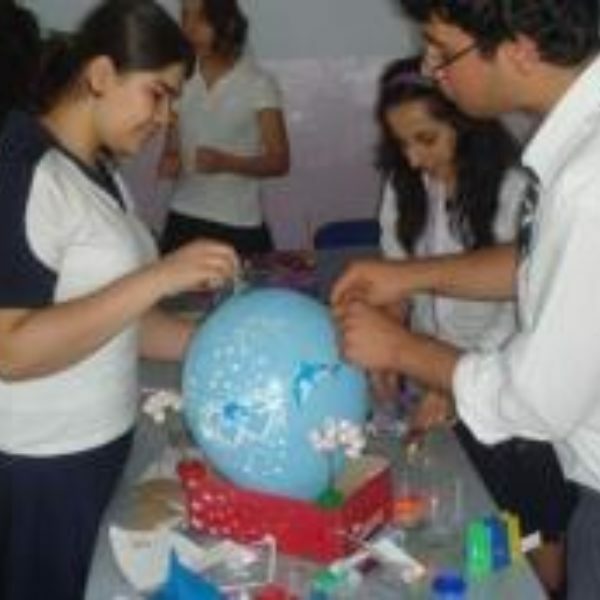 View and join 100+ iEARN Global Projects. 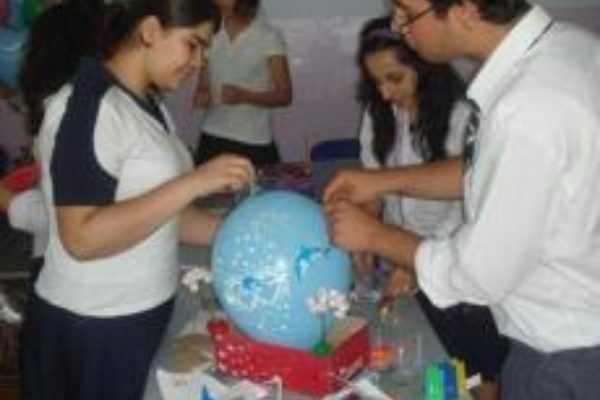 Become a part of a global community of educators in 140 countries.